Click a thumbnail graphic to view a gallery of drought data from the US Drought Monitor. US Drought Monitor February 5, 2019. 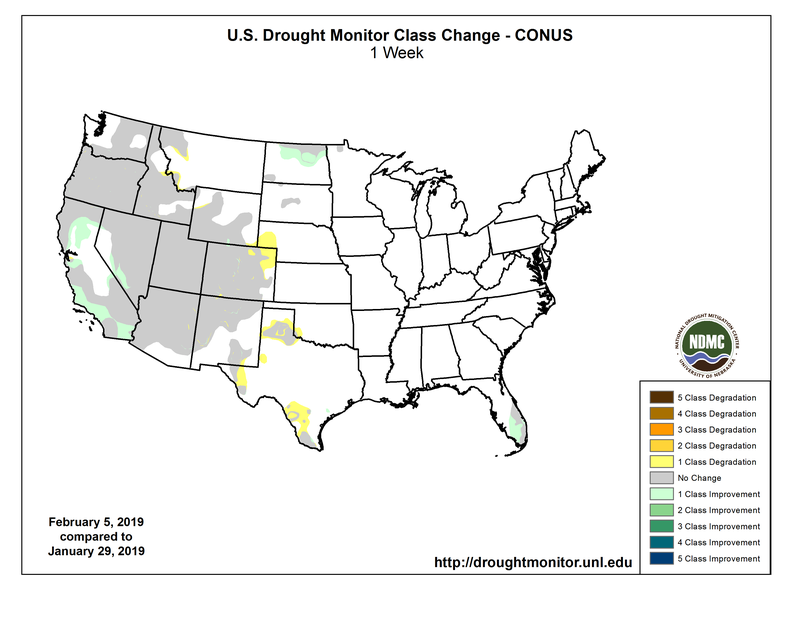 West Drought Monitor February 5, 2019. Colorado Drought Monitor February 5, 2019. During the next 5 days (February 7-11, 2019) a large storm system is expected to bring heavy rain, freezing rain, and snow to a broad area across the eastern Great Plains, the Ohio and Mississippi Valleys, the Great Lakes region, and the Northeast. Precipitation totals exceeding an inch will be common throughout these regions, with totals as high as 4 to 6 inches forecast in parts of Tennessee. But with respect to areas of dryness and drought, its impact will be limited at best. Only the D0 areas in the east half of the Dakotas will be affected by the fringes of the system, with a few tenths of an inch of precipitation resulting in several inches of snow. The CPC 6-10 day extended range outlook (February 12-16, 2019) calls for an almost identical temperature pattern featuring enhanced chances for warmth in the Southeast, and extremely high probabilities for below-normal temperatures from the northern Plains through the Pacific Northwest. southeastern Alaska also has elevated chances for colder than normal weather. The odds favor dryness in southeast Alaska during this period, but enhanced chances for surplus precipitation covers most of the contiguous 48 states. Chances for a wet 5 day period are particularly high from the California coast between Los Angeles and San Francisco eastward into southwestern Nevada. The only areas without elevated chances for heavy precipitation are western Washington, the Florida Peninsula, and from central and southern Texas westward through the southern High Plains. US Drought Monitor one week change map through February 5, 2019.